A mentally handicapped man is driven by a nightmare of his own reflection to kill everyone in his life, including his brother. Dennis has another dream in which a boogeyman called Cadaver unzips Dennis’ skin. Dennis ends up in a nightmare world confronting his reflection in an antique mirror. After picnicking together, Dennis’ older brother John and John’s girlfriend Lydia take Dennis to the ice cream store to see Dennis’ crush Susan. Upon returning to the home shared by the two brothers, Dennis is disturbed to discover John moved the antique mirror from his nightmare into Dennis’ room. Mildy Torres from Social Services comes to the house. Mildy informs John that he is under investigation and could lose custody of Dennis following an anonymous report of losing his temper around Dennis. After Mildy’s visit, John goes to see his therapist Dr. Preston for counseling regarding his situation. Dennis’ mirror reflection begins speaking to Dennis and manipulating him toward murder. Dennis also continues experiencing nightmares in which he is haunted by Cadaver. Lydia confronts John over her ongoing frustration with John avoiding marriage and dedicating himself to caring for Dennis. Their relationship woes are compounded later when Lydia mistakes a jewelry box containing earrings for an engagement ring. The reflection convinces Dennis to kill a neighbor’s cat, which leads to killing more animals. John is disturbed to discover Dennis building a secret room in the basement while also studying videos on taxidermy and forensics. Dennis dreams of being devoured by a giant spider. In the nightmare, his reflection becomes Cadaver, who bargains with Dennis to allow him to wake up in exchange for performing a task. Dennis’ reflection then directs Dennis to kill a child in order to prove that he isn’t stupid. Dennis murders a little boy in the park and puts his body in a basement freezer. Unable to afford ongoing therapy, John makes an arrangement with Dr. Preston for informal sessions over lunches at the Overlook Café. Lydia and Mildy each secretly observe John with Preston. Dennis’ reflection convinces Dennis to kill Susan. After Susan spurns him following an awkward attempt at asking her out, Dennis chases Susan into the street with a knife. A passing car strikes Susan, killing her. John and Lydia take Dennis to a themed restaurant for dinner. Dennis seemingly murders a man in the bathroom before confronting a disturbing vision of Susan. Dennis suddenly wakes to find himself still seated in the restaurant booth. Dennis convinces himself that the reflection cannot drive him toward murder if he does not fall asleep. John and Lydia go for coffee at the ice cream shop the next morning and learn that Susan died. John and Lydia both notice that they appear to be in a vague dream state, as familiar faces are missing from all of their local hangouts. The reflection instructs Dennis to kill Mildy. Dennis threatens to shoot himself with a gun in order to kill the reflection too. The reflection steps into reality, pushes Dennis into the mirror world, and assumes Dennis’ place. Mildy arrives at the house with two police officers to execute a court order for removing Dennis. Evil Dennis murders the cops and then Mildy. John confesses to Lydia that Dennis was a prodigy. However, John punched Dennis down a staircase when they were children, which damaged his brother’s brain. John explains that guilt motivates him to dedicate his life to Dennis. Moved by John’s revelation, Lydia tells John she is willing to move in together, even if Dennis is present. Lydia leaves to go pick up Dennis. John’s friend Pete confirms that the taxidermy and forensic materials were intended for Dennis, and not mistakenly switched with Chuck’s books, as John previously assumed. Suddenly connecting what Dennis intends to do, John rushes back home to rescue Lydia. When Lydia arrives at the house, Dennis tricks her with an illusion before stabbing her in the stomach. Dennis then drills a hole in Lydia’s head and turns her into an oversized doll. John comes home. John descends into the basement where he discovers Dennis has built a macabre theater and stage. John becomes restrained to a chair and is forced to watch Dennis perform a ventriloquist act with Lydia as his dummy. Dennis also presents a bizarre marionette show featuring Dr. Preston, Mildy, and other victims transformed into grotesque creations. John breaks free of his restraints and uses a gun to shoot himself. Dennis is devoured by his monstrous creations in the mirror reflection, although in reality, cops arrive at the scene and take Dennis into custody. Dennis is committed to an insane asylum. With the real Dennis seemingly caught in infinitely reflected mirrors, Dennis wonders if he is still trapped in his carnival dream from childhood. 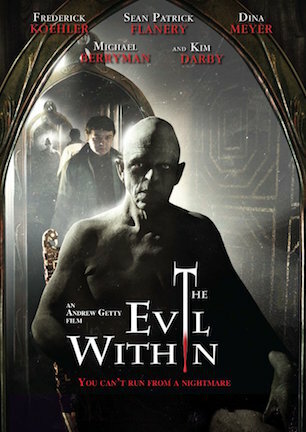 “The Evil Within” is exactly the sort of disaster you’d expect from a meth-addled oil heir with no filmmaking experience sinking a seven-figure sum of his personal fortune into five years of shooting before spending another eight years in post-production, only to be further paper clipped and rubber banded into some semblance of a movie posthumously released two years after the director’s unusual death. In other words, it’s a cinematic clusterf*ck of Tommy Wiseau proportions. Knowing a bit about how the film came to be is essential in appreciating its baffling bizarreness in context. Someone smart is undoubtedly developing a docudrama based on behind-the-scenes dirt. As weird as the true story is, it’s at least moderately more coherent than the fictional one in the film. Inspired by his own haunting nightmares, Andrew Getty, grandson of billionaire tycoon J. Paul Getty, drafted a screenplay called “The Storyteller” with the long-term goal of becoming a horror auteur. Cameras subsequently started rolling in 2002 on a production that would stop, start, stop, and start again through 2007, when Getty converted a room of his mansion into an editing and effects suite. There, he tinkered with the final footage for another on-and-off period lasting until his 2015 death. Getty’s longtime friend Noelle Leanne told People Magazine that Getty “was addicted to train wrecks.” Apparently so much so that he obsessed over orchestrating one of his own. Getty reportedly burned through as much as $6 million of his own money to bring his delirious vision to life through pointlessly elaborate setpieces and ill-advised equipment purchases. From the look of things, that budget estimate seems high by at least two zeroes. One scene set at a sea-themed Chuck E. Cheese knockoff is populated by ugly cartoon robots flailing so stiffly, a hobo would be embarrassed to call them “poor man’s animatronics.” Other visual tricks appear crafted from a prototype version of Adobe After Effects circa 1993. Producer Michael Luceri pieced the film together after Getty’s demise and finally stewarded it to distribution channels in 2017. Final cut was clearly cobbled from incomplete parts, as many characters are inconsequential, subplots stall in their tracks, and the narrative is regularly distracted by so much pompous preposterousness that a big bite of it makes no sense. Frederick Koehler stars as Dennis, a mentally handicapped man struggling to live under the overprotective guardianship of his huffing and puffing older brother John (Sean Patrick Flanery). Koehler’s performance is convincingly sympathetic, albeit uncomfortably problematic when removed from its 2002 conception year, when it was merely misguided, and viewed under a millennial light of political correctness, where it now reads as insensitively tone deaf. Dennis is disturbed to discover John ditched his comic collection to make room for an antique mirror because “it matches the motif of the furniture” in Dennis’ bedroom. The bigger reason Dennis is upset is because he recognizes the mirror from a nightmare that brought him face to face with an evil incarnation of his reflection. With the mirror now confronting him in reality too, Dennis descends down a dark tunnel toward madness where his aggressive reflection manipulates him into becoming a murderer. On occasion, the reflection morphs into Michael Berryman, playing a boogeyman the credits call Cadaver. I’m not entirely sure what role Berryman’s demon is/was meant to play. But he does front the box art, so it must have been necessary at some point. That sentiment fits virtually everyone in the supporting cast. Dina Meyer makes out the best of anyone as Lydia, a frustrated girlfriend who can’t see her future with John when Dennis is in the picture. A social services worker threatening to separate the brothers based on an “anonymous” welfare endangerment tip is also in the mix. “The Evil Within” seems to set up a side story insinuating Lydia is surreptitiously pulling puppet strings here. But the custody and relationship dramas are only two more bungled buds dying on the vine as the film fumbles forward. John also sees a therapist who is important enough to have two solo scenes with John, even though their interactions have nearly no bearing on anything. John spots another random character and exclaims, “there’s Pete! Pete from the bookstore!” Who is Pete? Who knows? He probably has something to do with Chuck, a character never seen who both men mention in conversation. Everyone onscreen seems to echo the same “WTF?” expression you’ll have while watching, as even the people involved cannot figure out what the Hell their movie is doing. The full film extends itself so far past “bad” and into “bonkers” that it becomes a curiosity of pitiably imprudent ineptitude. From disjointed fiction to overwhelmed ambition, “The Evil Within” truly is to horror what “The Room” is to drama. You should see it for yourself, if only to be in awe of its awfulness. May 26, 2017 by Ian Sedensky.